You can help support CoastSavers and the many people actively engaged in saving Washington's Pacific Coast from the harm of marine debris. This October we were deeply saddened by the loss of a dynamic, creative colleague and fellow CoastSaver, David Lindau. His enthusiasm and spirit will be sorely missed. Working as Associate Director for Discover Your Northwest, David was the founding coordinator for CoastSavers. In 2007 he helped bring together the coalition of dedicated volunteers and partners that would become the Washington Clean Coast Alliance, a foundation of CoastSavers. After moving on to apply his talents with Seattle tech companies Amazon and Zillow, he continued his work as the CoastSavers web guru. David volunteered countless hours over the years, dedicated to helping keep Washington's coastlines free of marine debris and to increase awareness of the efforts of CoastSavers. An example of how one person can serve to inspire others, David was twice awarded Volunteer of the Year by Olympic Coast National Marine Sanctuary, and declared a Sanctuary Hero by the National Marine Sanctuary. An extraordinary honor worthy of his dedication. Please consider making a donation to Washington CoastSavers in David's name, to honor and continue the good work that he valued so deeply. If you have walked along the Washington coast, you may have noticed all kinds of trash washed up on the beach: plastic water bottles, fishing nets, old tires, and maybe even a rusted-out crab pot or two. This debris poisons and kills marine mammals, seabirds, and other wildlife - and spoils the natural beauty of our coast. The Washington CoastSavers program organizes several beach cleanups throughout the year to get this nasty stuff out of our marine environment. 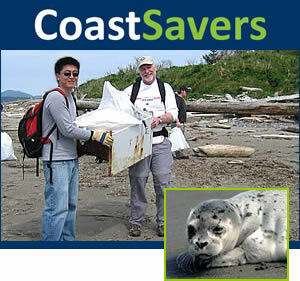 To view clean-up event schedules and sign up for an event, visit CoastSavers.org. A $50 gift covers the cost of supplies and trash disposal fees for a family to participate. A $100 gift buys about 300 trash bags - enough for volunteers to carry away over 5000 pounds of harmful debris. Feeling really generous? A $500 gift can cover the cost of a dumpster and trash disposal fees for an entire beach! Be a CoastSaver and make a donation today!